Ah, the HP-75! I had the pleasure of using a prototype before they came out and bought one for myself as soon as they did. Considering that it was the cost of a serious portable workstation today ($3000+) after inflation, that wasn't easy. But its typeability, huge battery life and built-in functions were unmatched at the time. It's "Pocket Secretary" time and appointment functions may have been the first of its kind. I remember noting that if now I were to set an appointment for the fifth Wednesday of February, it would immediately recognize that as being February 29th, 2040 (!). Not shabby for a machine of its day. 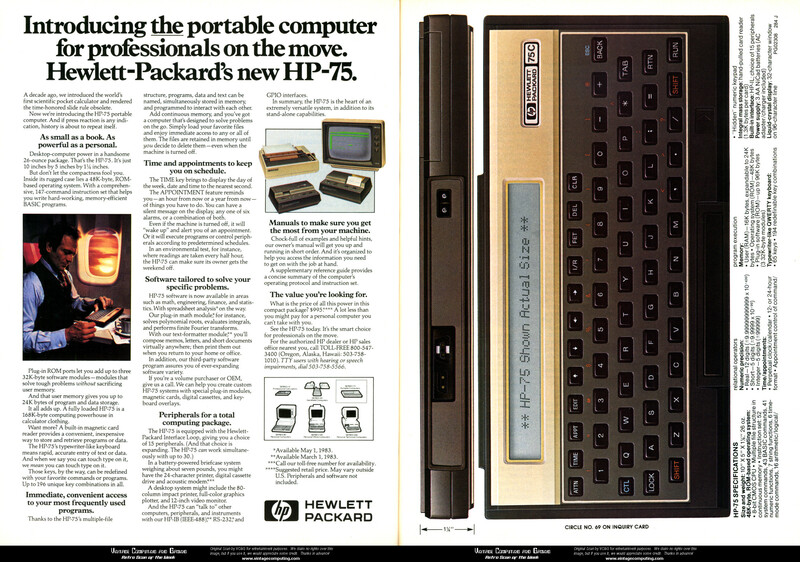 Of course, the HP-71 would appear a year later and, being smaller and in many ways more capable, pretty much blow the '75 away. But I've always had a soft spot in my heart for the '75 just as Joe does for the '71. Long life to both - and to their many fond users! I remember the first time I saw one, brand new, at Educalc. It looked fabulous! I do wonder what might have been going through minds at HP though when they knew the 71 which was smaller, cheaper, and better in almost every way would come out a year later. I'm sure there's no way they could have gotten back what they invested in development cost on the 75. How many did they sell, anyway? The 71's development must have ben 75% finished when the 75 came out ahead of it. I do have an old, beat-up 75 someone gave me, and two 71's in excellent condition, one basically being brand new (NOS). I typed on the 71 a lot before they discontinued it and I figured I better slow down since if I wear out the keyboard, there won't be support for long. I could type about 30 wpm on the 71 (twice that on a full-sized keyboard), and had a very full-featured text editor I wrote using a load of LEX files from the Paris users' group published in the CHHU Chronicle.